The home of the great blue heron, feeding grounds for rattlesnakes and fox snakes, and breeding habitats for numerous amphibians are all being threatened. 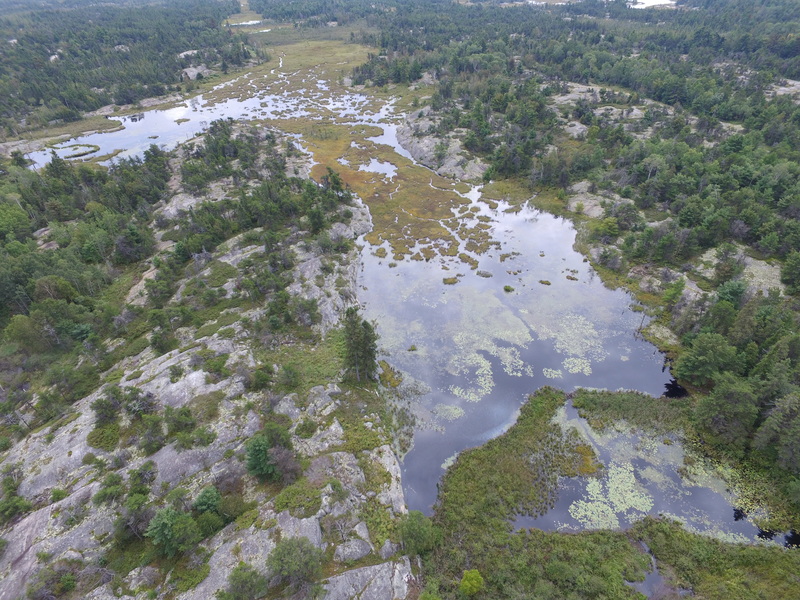 These are the coastal wetlands of Georgian Bay and they are essential to a healthy environment. Unfortunately, wetlands across the world are at risk from shoreline modifications invasive species and from climate change. The swamps, marshes and bogs distributed throughout our freshwater archipelago are home to a diverse group of plants and animals. They also help to control floods from extreme weather, and filter pollutants from rainfall. Thankfully, the coastal wetlands of eastern and northern Georgian Bay are still relatively healthy and protected from roads and human development, but that doesn’t mean we should not be concerned. In 2015, Georgian Bay Forever worked with NASA, to create wetland maps of Georgian Bay using satellite imagery. This project was designed to monitor changes in wetland habitats because of decreasing lake levels and climate change. The 2018 State of the Bay ecosystem health report presents the results to better understand the overall changes to wetlands. Using the images, it was found that between 1987 and 2013, there was a 7% increase in coastal wetland cover in northern Georgian Bay and a 10.8% loss in southern Georgian Bay, which means there was an overall net loss of 3.8%. When looking at the results however, it is important to understand that it isn’t the overall loss or gain that we should focus on, but the local environmental impact – what happens to your local wetland? Changes to water levels and wetlands affects the types of plants and animals that can survive, and the amount of habitat available. The 10.8% loss of wetland cover in southern Georgian Bay may have a significant impact on the levels of fish in the area, as well as other economic and ecosystem services. Research shows declines in populations of northern pike, as wetlands are lost. Focusing on local environmental impacts also means that we can more easily get involved in protecting and monitoring wetlands in our own backyards. The Marsh Monitoring Program, established in 1995, encourages volunteers to record trends in marsh birds and amphibians around the Great Lakes. Over the years, this program has demonstrated that several species of marsh-dependent birds, like the black tern and Virginia rail, have declined and more generalist species, like the yellow warbler and mallard duck, have increased. The Early Detection and Distribution Mapping System is another way to get involved. This is a reporting tool where you can submit invasive species sightings using a smartphone or computer. You can upload a photo for experts to then identify. This information, once confirmed, is then readily available for scientists and the public to access and use. It is important to have accurate data on invasive species locations to improve our ability to manage them. One invasive species that is a significant threat to the health of coastal wetlands is phragmites. They are a non-native species from Europe and aggressively out compete native plants. Georgian Bay Forever is working with community groups to report and remove them. With the help of about 30 groups, they have removed over 77 000 pounds of phragmites from Georgian Bay shorelines. Visit georgianbayforever.org to learn more.